Direct-push technology (DPT) sampling may not be the most exciting drilling methodology, but it is a great way to conduct site characterization for environmental sites. DPT sampling is more commonly referred to as “geoprobing” after the company that pioneered the technology, Geoprobe. This method “pushes” the tool string into the ground utilizing the weight of the rig and, if necessary, percussion. Direct push tools do not remove cuttings from the probe hole but depend on compression of soil or rearrangement of soil particles to permit advancement for the tool string. Not only can this method collect soil samples in core barrel samplers, but it can also install soil vapor sampling points, temporary well points, and even permanent monitoring wells. This allows clients to sample different media with the same rig in the same mobilization. This flexibility makes the technology well suited for initial site characterization-type investigations. 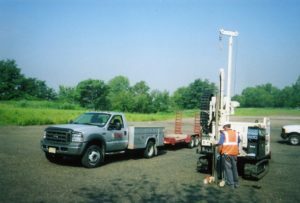 B&B operates two track-mounted Geoprobe units (6610DT & 7730DT) that are easily deployed to sites throughout New Jersey and beyond. These smaller footprint machines are able to access areas that are inaccessible by larger rigs and areas that rubber-tire machines cannot get to. We often deploy this equipment with “soft dig” equipment such as the air lance/vacuum setup and hand tools. Soft Dig/DPT Sampling – Utilizing the air lance/vacuum setup our crew soft dug 70 boring locations to a depth of 5 feet. The Geoprobe was then setup on each hole and collected soil samples to the target depth of 12 feet. Interior Monitoring Well Installation – A permanent 2-inch PVC monitoring well was installed inside a small warehouse in northern New Jersey. Our crew utilized a core drill to core through the concrete floor. Hollow-stem augers were then used to drill the borehole to 15 feet deep at which point the well materials were installed. The well was then completed with a flush-mount manhole installed in the original core hole. Bedrock Well Installation – Our client needed to install a shallow bedrock at a location that our typical air rotary rig, Ingersoll-Rand T4W, could not access. We were able use our 6610DT equpiped with an air hammer and drill bit to get the job done with the T4W rig parked nearby to supply the compressed air. The well was drilled and cased through the overburden and 20 feet into competent bedrock at which point 2-inch PVC well materials were installed. Remote Sample Collection – This particular site was inaccessible by our track rig. Our crew utilized the DPT tooling with a gas-powered jack-hammer to drive in the tooling and collect soil samples. Temporary well points were also installed in these boreholes. The HRS and B&B Drilling companies are a leading drilling contractor providing environmental investigation, water well drilling, dewatering and geothermal services to the Greater New York and New Jersey area. For more information contact us or call us at 973-347-2250.